The Walgreens Way to Well Health Tour with AARP is coming to Cleveland from July 12th - July 30th. This community outreach program is dedicated to providing FREE prevention and early detection health services by providing free health tests, assessments, education and consulting services to communities. The tour is dedicated to improving the everyday health of Americans by providing the prevention and early detection of heart disease, cancer and diabetes. Heart disease and cancer are the two leading causes of death in the Unites States and diabetes is the nation’s fastest growing disease over the past 10 years. The tests are valued at over $100 and only take about 20 minutes to complete. Thanks to the Walgreens Way To Well Health Tour with AARP they will be absolutely FREE and available to anyone ages 18 and over. No appointment or insurance is necessary! After the test, participants will consult with a Walgreens pharmacist or certified wellness staffer about the results. All participants who attend will receive one year FREE AARP membership. Participants under the age of 50 can pass the free AARP membership on to an eligible adult, and existing members will receive a one-year extension on their current membership. If you are unable to make it to the tour and would still like to contribute to this amazing program, you can do so by purchasing any of the Walgreens brand health and wellness products. 1¢ from the purchase of every Walgreens brand health and wellness product, up to $3 million annually, will support bringing preventive wellness services to local communities. 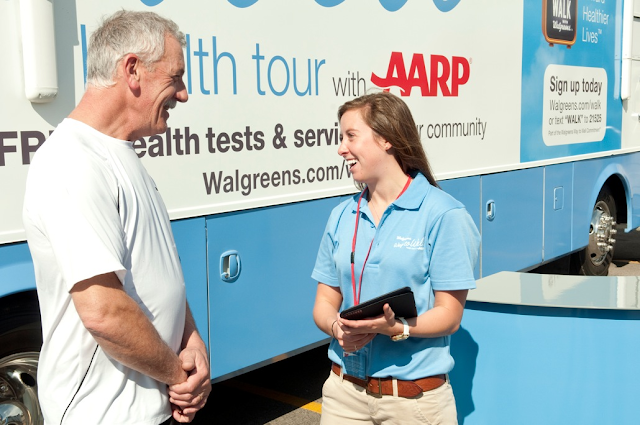 If you live in Cleveland or plan on visiting the area from July 12th – 30th, please be sure to make time to visit the The Walgreens Way to Well Health Tour with AARP and take advantage of this wonderful FREE program. Not able to make it to Cleveland? The health tour is comprised of a fleet of four customized vehicles that will simultaneously tour separate regions of the U.S. and Puerto Rico. Please visit The Walgreens Way to Well Health Tour with AARP to view all of the dates at a location near you. Disclaimer: I was compensated for this post. All opinions expressed are my own. Like Karen At Home on Facebook for or Twitter for even more tips for your life and home!